One of the things that video games can do magnificently is create worlds. From the satirical real-world analogues of Rockstar’s Grand Theft Auto series to the historical simulacra of Assassin’s Creed infused with secret meaning, from Super Mario‘s candy-coloured vistas to the stark alien worlds of Metroid: in games we can experience spaces that are uncanny twins of real places or that are thrillingly new. This isn’t exactly a series of posts or a new feature as an occasional exploration of games that I love because of where they take me. 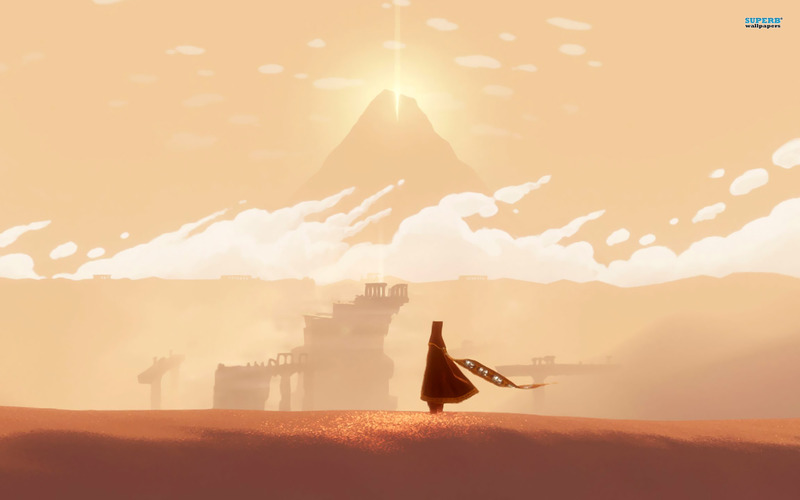 One of these games is Journey, originally developed by Thatgamecompany for the PS3 and now available for the PS4. In terms of its gameplay, it’s a simple game, almost entirely devoid of challenge; it has also been called an ‘art game’ and I’m sure there are some who would even deny it’s a game to begin with, for some reason or another. It wonderfully evokes a sense of place, though: in Journey you’re a lone traveller, perhaps a pilgrim, marching onwards towards the distant mountain through deserts, among abandoned ruins, across the bottom of the ocean and up snowy slopes towards the goal that keeps getting closer even as it remains tantalisingly out of reach. While the actual virtual locations are fairly small and can be traversed in a few minutes, they come alive through a wonderful blend of the real and the imaginary. Visually, Journey has a minimalist but beautiful style, using strong colour contrast and simple shapes to evoke less real places than our dreams of such places. There’s a sparsely surreal quality to the deserts you travel through early in the game, as if Lawrence of Arabia‘s vistas had been reimagined by Giorgio de Chirico. At the same time, the place is tangible: you leave behind lines in the glittering sand as you move through it, sliding down dunes. There’s a tactility to these environments and your place in them; late in Journey, as you travel up the mountain towards your destination, the cold wind holds you back, slowly freezing you in place. Journey‘s spaces feel both alien and real – these are worlds you could otherwise only explore while asleep, but you feel the sand between your toes, the snow on your face. Journey offers fairly little in the way of interaction to its players, its chief method of interaction being movement, and the game gets that very right. The player avatar becomes a part of the world, where in a lesser game that avatar feels superimposed on it. Other than walking around, the player can also fly, though this power is very much limited and feels less like the kind of power fantasy common to gaming than like a moment of freedom – again, very much like in dreams. There is one more thing the player can do, though, and that’s where the world gains a dimension: he or she can sing… and if others are around, they will hear that song. Journey is a multiplayer game, but it’s a most unusual one: on your pilgrimage to the mountain, you encounter other pilgrims, looking exactly like you. They walk, fly, and they sing; where one pilgrim may chirp in short, playful sounds, another may hold a note, almost as if inviting you to join voices. It’s strange how other people can make a virtual space in a game feel more real, but that’s definitely how I experienced Journey. It’s maybe a bit like Marianne Moore’s “Poetry”, which talks about “imaginary gardens with real toads in them”: if you inhabit a world of the imagination with someone who may be incomprehensible to you but who is real, reacting to your movement, your flight and song, then that world becomes more real as well. Some of the pilgrims I encountered in Journey went exploring with me, others were kind guides pointing out an interesting ruin or a forlorn statue for me to find, and yet others seemed to sing at me in an increasingly frustrated voice, unable to make me understand their song. And then there were some that ignored me entirely. Yet most accompanied me, for a short while or for longer stretches, on my pilgrimage towards that mountain. For a few moments, they were friends, the only friends I found in that strange world. And when I dream of the desert and the bottom of the sea and that mountain, I also dream of their song. It’s those disembodied voices that we’ve left behind, floating over the dunes.